The body of a middle-aged man is discovered in Southampton's red-light-district - horrifically mutilated, with his heart removed. The pattern emerges when another male victim is found dead and eviscerated, his heart delivered soon afterwards. The media call it Jack the Ripper in reverse; revenge against the men who lead sordid double lives visiting prostitutes. For Grace, only one thing is certain: there's a vicious serial-killer at large who must be halted at all costs. This is another thriller in a series with Helen Grace that I'm enjoying. 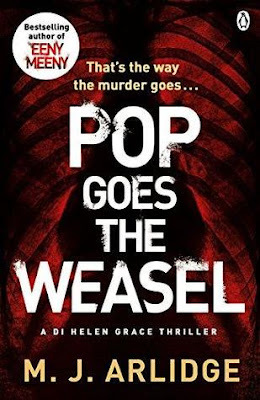 I liked Eeny Meeny, the first book in this series and Pop Goes the Weasel is a nice second one! Short chapters: The chapters in this book are short and I get the idea that this is something that makes me read a book a bit faster. Almost every chapter is ended with a plot twist, or something new that is discovered, which makes me want to keep reading. Action paced: This book is very action paced. Like I said; almost every chapter ends with a discovery or a plot twist. This makes it a exciting book to read, I almost couldn't put it away. Also POV from killer: What I really enjoyed, and not all crime books have this; the POV from the killer. You don't know who the killer is, but you get the point of view from this person and this really gets you involved in all the gruesome things that are happening. Can't think of any: I can't really think of a con in this book, but it's also not a favorite of mine. I can't give this book 5 apples, but I still really enjoyed the book. So; I won't be really able to explain why, it's just a feeling! This series with Helen Grace is awesome. Helen Grace is not your standard main character, she is intriguing! If you haven't read Eeny Meeny, you should read it, that's the first book in the series and I recommend reading it before this one. If you like crime thrillers, this is one for you! "Dark, twisted, thought provoking, and I couldn't turn the pages fast enough." Are you a fan of crime thrillers!? It's a really nice crime series to read!! I love getting the killer's pov. I think it really adds to this kind of story. Great review!